The VWR 4°C Laboratory Refrigerator SCGP-3004G provides basic everyday refrigeration storage of samples with a convenient see through door. This general-purpose laboratory refrigerator has an adjustable thermostat, at the back of the interior chamber with dual circulating fans to distribute cooled air. The VWR fridge is 30 cu ft in capacity, with adjustable shelving, and a bright white interior that’s easy to clean. This lab fridge has a single hinged door, with a magnetic gasket for positive door closure and insulated glass that allows users to inventory their samples quickly. This 4°C refrigerator uses CFC free, refrigerant, and foamed in place insulation. 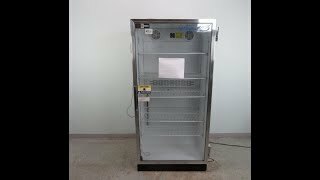 This VWR 4°C Laboratory Refrigerator SCGP-3004G has been fully inspected and comes with current temperature validations. All of our lab equipment comes backed with our standard warranty. Should you have any questions, please don't hesitate to contact us.